Genetic testing says Paul Ryan is 3% Jewish – what the hell does that mean? Saving the planet from climate change will demand that we make lifestyle sacrifices – but returning to the Stone Age isn’t for everybody. People are therefore placing their fond hopes in future technology not invented yet, which will swoop in to save us from ourselves, a la Batman, and reverse or at least halt the trend. But one thing we may have to cross off the list is cooling the planet by blocking sunlight with “stratospheric veils.” Based on how violent volcanic eruptions that diminished sunlight damaged crops, solar radiation management could cause as much harm as good - with a zero net effect, a new study published in Nature on Wednesday postulates. Stratospheric veils are a geoengineering concept, explain Jonathan Proctor and Solomon Hsiang of UC Berkeley. They don’t rule out use of them one day, but warn of unintended consequences – which could include what they call "agricultural drawbacks". |It would be an ineffective tool to mitigate climate change damage to agricultural production because the benefits that are gained from cooling are offset by damages due to a reduction in available sunlight," Proctor explained to Haaretz. The geoengineering theory suggests massively injecting sulfate aerosols into the upper atmosphere, creating a sort of stratospheric veil that reflects some solar radiation back into space. It is hard to experiment on the atmosphere. One can hardly create a localized stratospheric condition to see what it does. So the scientists sought the closest analogy, they explained, and found it in powerful volcanic eruptions that chuck sulfate particles high into the stratosphere, changing the quality and quantity of sunlight. Based on their results, in net terms, they argue that the diminished sunlight could be as bad for crops as higher temperatures. Heat stress is bad for crop yields. "We studied the effect that solar geoengineering might have on global agricultural production and find that, as intended, the reduction in extreme heat benefits crop production," Proctor says. "We also find, however, that the shading from solar geoengineering could make crops less productive, because crops use sunlight to grow. For agriculture, the unintended consequences of reducing sunlight offset the intended benefits from cooling." Hsiang went one further, comparing it with chemotherapy, which has “dramatic side effects” only worth it if the risk of harm caused by the disease is even worse. 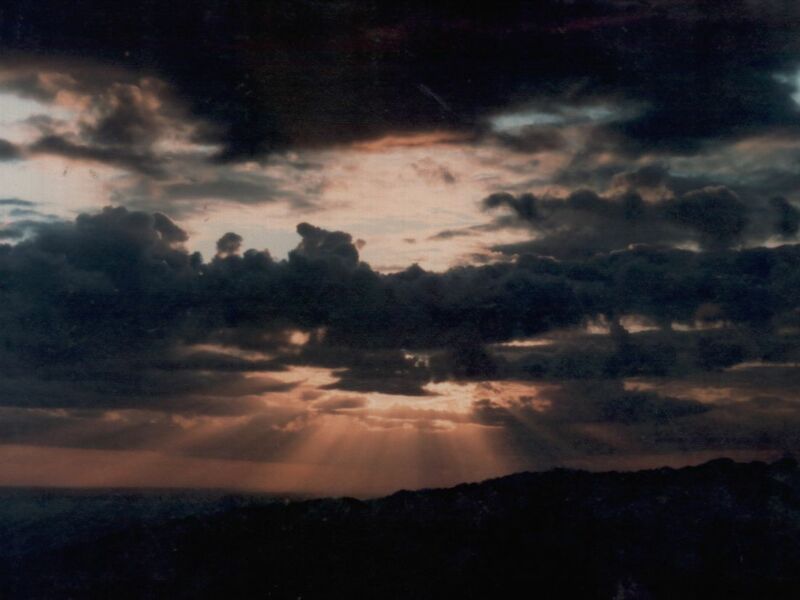 The idea behind scattering the light back into space is that the planet would shelter beneath this reflective artificial cloud like we seek shade beneath trees, Proctor explains. 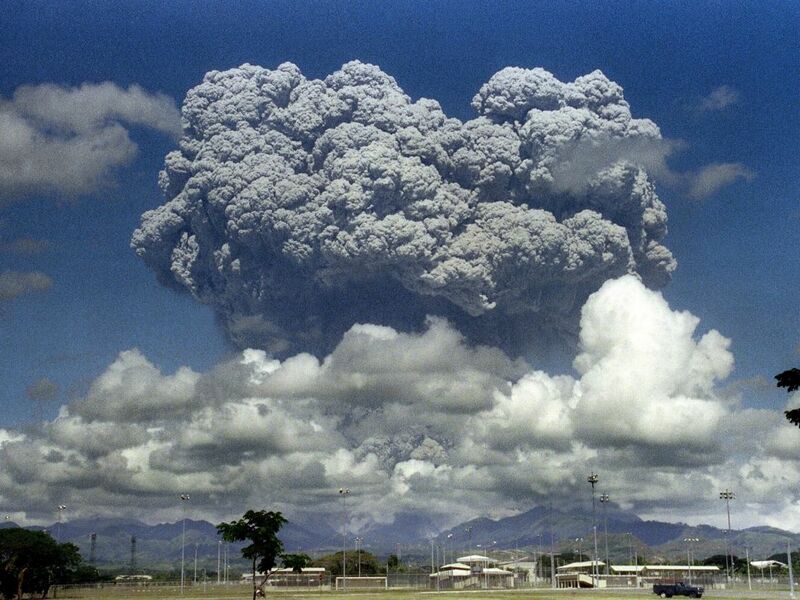 To study that without actually creating a stratospheric veil and deploying it, the scientists extrapolated from volcanic eruptions so powerful that they tore through the atmosphere and punched into the stratosphere: the 1982 explosion of El Chichón in Mexico and the 1991 blast of Mount Pinatubo in the Philippines. They focused on Pinatubo and El Chichón because size does matter. The two shot large amounts of sulfate aerosol precursors right into the stratosphere, lasting weeks – which actually inspired the veil concept in the first place, says the team. 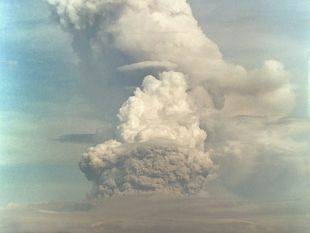 Most eruptions are locally impressive but don’t reach the stratosphere, Proctor explained. It’s like the difference between fireworks versus atom bombs. These two just had more force and propelled stuff into the high atmosphere, while other eruptions by lesser cones didn’t move global statistics. Pinatubo, for instance, ejected 20 million tons of sulfur dioxide. Its activity reduced direct sunlight by 21 percent, increased diffused sunlight by 20 percent and, all in all, reduced solar radiation by 2.5 percent. Rainfall was affected (on the downside) and the global temperature dropped by about 0.5 degrees Celsius (0.9 degrees Fahrenheit), says the team. Mexico’s El Chichón emitted 7 million tons of sulfur dioxide. The sulfur dioxide from the two volcanoes underwent oxidization to form stratospheric sulfate aerosols, and that is what spread. These aerosols in the high atmosphere circled the equator, slowly spread to the poles, and then fell out of the sky. The aerosols increased the opacity of the stratosphere above the baseline level for several years, and affected global weather for a year or two, Proctor explains. And how did these eruptions affect agriculture? The team found diminished yields of key crops, including rice, soy and wheat – which like heat and sun. Even maize, a form of starchy corn that grows well in cool wet climes, was hurt. Note that they wanted to investigate the benefits and risks of geoengineering the stratosphere, no more, Hsiang stresses: they were not looking at other potential effects. Nor are they pro or anti geoengineering: they counsel against writing off the technology at this stage. "For agriculture, our findings suggest that sulfate-based solar geoengineering might not work well to avoid the damaging effects of climate change. However, there are other sectors of the economy that could potentially benefit substantially, or be substantially damaged, we just don’t know," says Proctor. "Just because the first test of an experimental surgery had side effects for a specific part of the human body does not mean that the procedure is always immediately abandoned. There are many illnesses that are so harmful that procedures known to cause side effects are sometimes still worth the risk," he says: Research into geoengineering should not be entirely abandoned. "There may remain good reasons to eventually pursue such a strategy despite some known costs." That said, it bears adding that creating effective stratospheric veils would take enormous effort. One model the group worked with, designed to emulate Pinatubo, estimates that the amount of material necessary to reduce global temperature by 0.9 degrees Celsius is half the amount Pinatubo ejected per year. If humankind does elect to veil the skies in the hope of cooling the planet, the artificial aerosols will need constant replenishment. If we want to diminish global warming by 2 degrees Celsius, scale up the numbers: that’s a synthetic Pinatubo a year.